Do you ever fancy getting crazy in Las Vegas but you never found the right opportunity to go? Would you like to play a game thats has an environment mimics Las Vegas? From the comfort of your computer, the Crazy Vegas free slot game gives you an opportunity to fulfil your dream. As a 5-reel, 20-payline game, it comes with a bright interface and cash-rich icons, which remind the player of Las Vegas’ ambient atmosphere. The games features, which are Vegas-themed, include a progressive jackpot that is randomly triggered to fulfil your dream of visiting the casino games capital, and obtain significant riches. In fact, the game’s theme is quite straight-forward. The moment you log on, you will see an assortment of trees lining the space surrounding the reels. Afterwards, you will see several Vegas-themed icons such as Elvis, a show girl, money, dice, and a roulette wheel. On top of the progressive jackpot, the Crazy Vegas slot online game features the wild and scatter icon, which helps players win free spins and multipliers to boost the game’s excitement level. 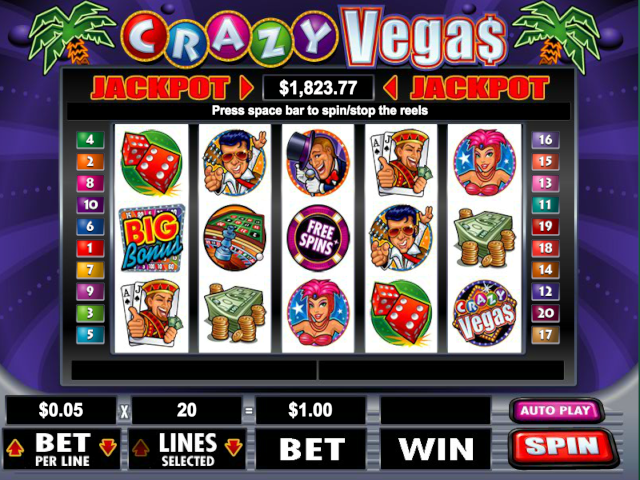 Crazy Vegas gives players a platform where they can win free spins, randomly triggered progressive jackpot, multiplier, and other game prizes. The game’s logo acts as a wild and scatter icon, and replaces others to increase the player’s chances of winning. Actually, with three or more Crazy Vegas icons on the reels, you can earn up to 100x of your total stake. The chip icons trigger the Crazy Vegas slot online game’s free spins feature. Essentially, three free spins’ chips anywhere in view trigger the free spins feature. The amount of icons in the first two free spins chips establishes the amount of free bonus spins, while the amount in the third chip establishes the win multiplier level triggered during the feature. During the bonus game, the feature cannot be retriggered. If you land the Big Bonus icon on the first and fifth reel, you can trigger the Big Bonus Game feature. You can also trigger a win multiplier if you pause the wheel by pressing the Big Bonus button. Also, the Crazy Vegas online slot mini-game features two wheels, and the number of inner wheels is multiplied by the number of outer wheels. In conclusion, the Crazy Vegas slot has two major bonus features that add a twist to the game. The two features that will make your day include the base game payoffs and the progressive jackpot.